No. 11, Jalan Pengasah 4, Batu 3 1/2, Off Jalan Kapar, 42100 Klang, Selangor, Malaysia. Bold Technics Sdn. Bhd. 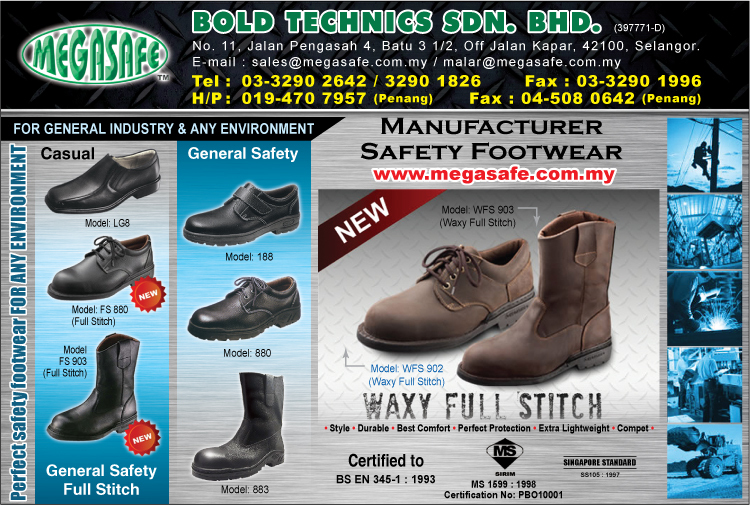 is a Malaysia registered company and have been in the above safety shoes of profession for the last 13 years. And technical experience for 30 years. Since our conception in 1996, we have developed remarkable business growth in this region. Our Quality is our benchmark! BOLD TECHNICS employed a team of professionals craftsman, equipped with the latest equipments and technology. Throughout years of experience, BOLD TECHNICS is confident to meet superior quality to our customers' satisfaction on-time and on-cost.